Georgian Downs is a leading provider of Standardbred racing, pari-mutuel wagering, and entertainment in central Ontario. 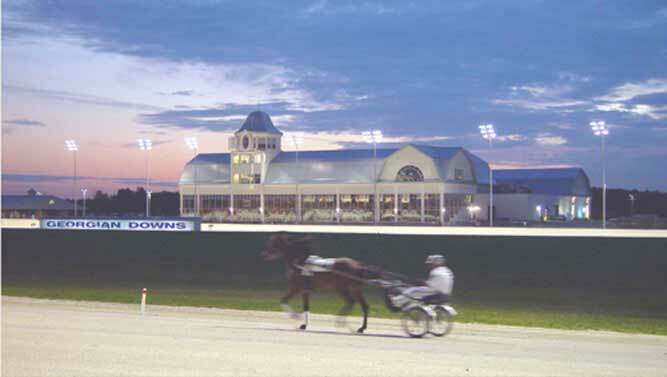 Since opening in November 2001, Georgian Downs has provided its guests with live Standardbred racing on a state of the art racetrack and comprehensive on track wagering. Georgian Downs now operates under the Standardbred Horse Racing Alliance and hosts live Standardbred racing during the summer months. Can I exchange US currency at Georgian Downs? Can I bet with US currency? The Georgian Downs Teletheatre is open 363 days a year. When does live racing take place? Georgian Downs live racing takes place on Tuesday, Saturday and Sunday evenings. What are the admission and parking fees at Georgian Downs? General admission and parking are always free. Names of racetracks being simulcast today and post times? A complete list of post times and simulcast products are available here or by calling (705)726-9400, ext 308. Where can I get race results for Georgian Downs races? Is Georgian Downs wheelchair accessible? Yes. However, if you are making a dinner reservation, please advise reservations at the time of booking that you will require a table that is wheelchair accessible. Georgian Downs is located only 50 minutes north of Toronto. Are children welcome at Georgian Downs? Yes. Children are welcome at Georgian Downs. You must be at least 18 years of age to wager on the horse races. Is Georgian Downs licensed to serve alcoholic beverages? Are pets allowed at Georgian Downs? Dogs and other pets are not allowed on the property of Georgian Downs with the exception of certified service animals. Can pictures be taken at Georgian Downs? Yes. Customers are welcome to use cameras and /or camcorders while visiting Georgian Downs racing areas. However, please refrain from using flashes around the horses, and from taking pictures of other customers. Are there bank machines at Georgian Downs? Yes. There is a $3.00 fee to process each transaction.